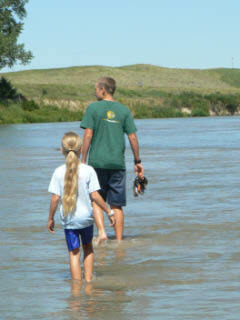 Nebraska was beautiful! Who knew there was more than grass there? 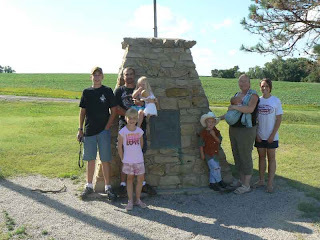 I wasn’t very impressed when we first drove across the border from Kansas to Nebraska on Hwy 281 north of Lebanon, where we stopped to see the geographic center of the United States, (see previous post). The second we crossed into Nebraska the roads got so bumpy! My son, Cody, commented on how terrible they were compared to Kansas. Well, the roads did get better further into the state. 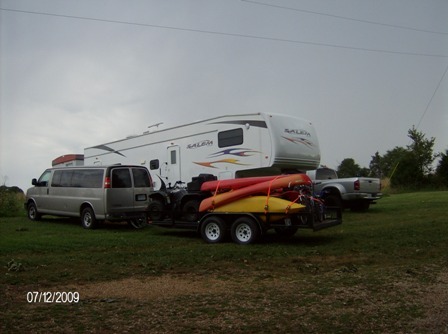 We turned west on 136 in Red Cloud and stopped in Alma at the city campground. Our neighbor was freaking out because she said that if we ran our washer/dryer it would blow all the fuses to everyone’s electric. Shae engineers electrical stuff and said it would be fine. I, of course, trust my husband. The lady was quite aggravating and I had to remind myself that she just needs Jesus. We left first thing Saturday morning, heading for northern Nebraska. We were hoping to volunteer at a camp in Lexington Nebraska, but could not. I heard that the Sand Hills in central Nebraska were considered one of the top ten drives in America. The sand dunes are the largest in the western Hemisphere. Now I love a good museum, but I love God’s natural museums even better. I couldn't wait to do this drive. We got on Hwy 2 and headed west. I must agree, that drive was incredible. It was so peaceful - a calming beauty. Rolling hills with intermittent trees. There was a beautiful river that ran along the side of the road. It looked so refreshing. I just wanted to jump in at the next available spot. We stopped at the Nebraska National Forest - Bessey Ranger District. From there were jumped into the beautiful river and body surfed it down a ways. The sand between our toes felt amazing and so incredibly refreshing I can hardly wait to go back.. someday. This forest covers more than 90,000 acres and is the largest hand planted forest in the world! 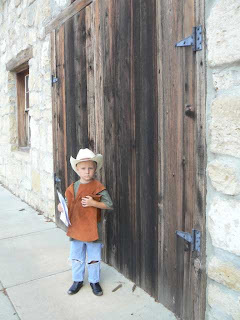 There were ranches here and there. Not many people, not many towns. I loved being out in the middle of such breathtaking scenery without the busyness of cities and traffic. We could have spent a week there easily. There was a campground there and a few campgrounds on Hwy 2. 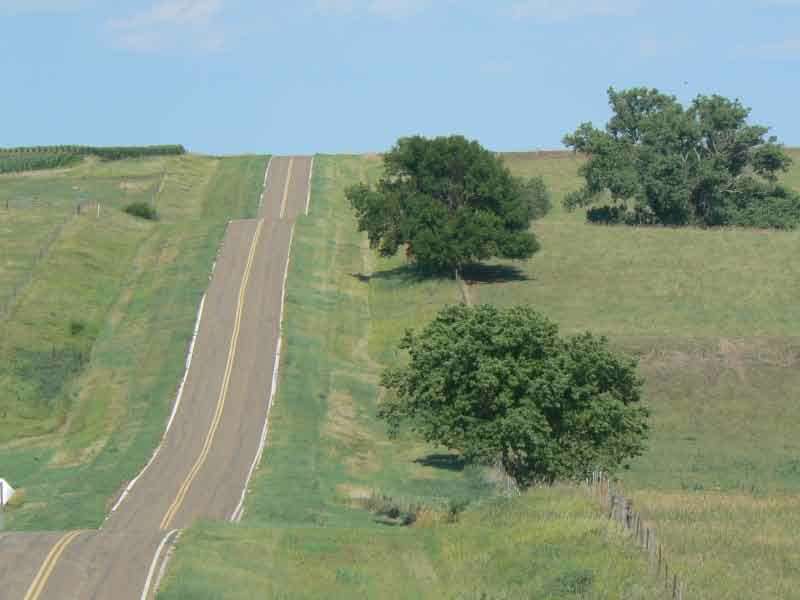 Since we had a reservation in South Dakota, we needed to move on. I am going to try to buy 5-10 acres on that river. I don’t want to live there permanently, but I want to spend a month a year there. It would rejuvenate me in every way. There aren’t a lot of gas stations so make sure you fill up before you head out on Hwy 2. 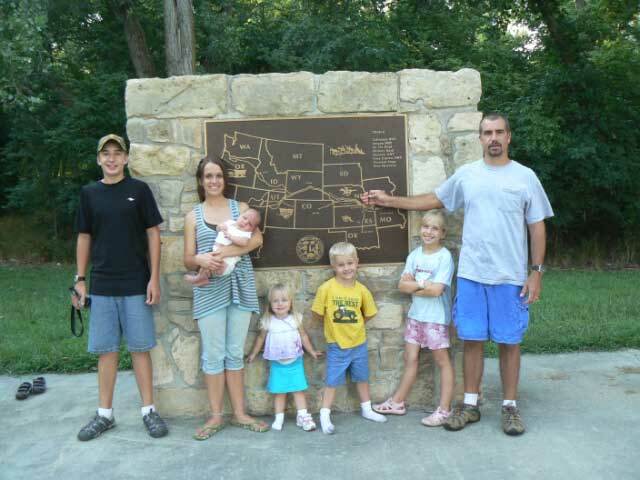 We drove all the way to Alliance Nebraska that night. 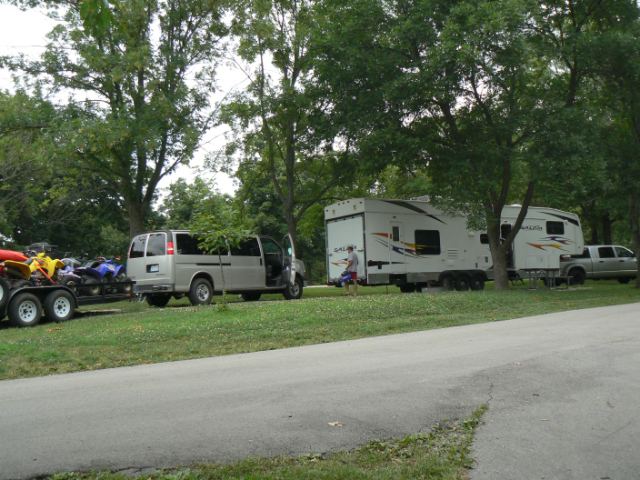 We stayed at a little parking lot campground on the edge of town. It did it’s job, plus we had cable! Everyone loved that. It is such a tourist trap…and we totally fell for it. This man, buried cars in the ground in the exact shape and size as the real Stonehenge The kids ran around it and on the little path way. It was free, or we would have driven by. There was a little food stand there, but we didn’t get any. There wasn't anywhere for us to park, so we had to leave the camper, truck, van, and trailer on the side of the road, where the sign said “No Parking”! 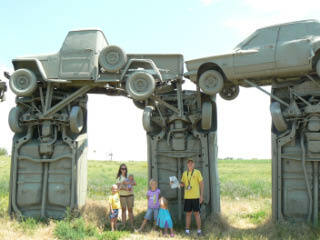 Shae and I took turns with the vehicles while the other looked at the strange car monument. It gave us a good laugh and headed on. A while down the road we came to a wonderful little museum. It was early afternoon on Sunday, and everyone was hungry, as usual. 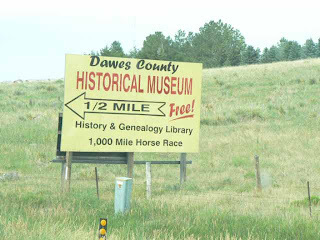 We try not to eat out much, so we pulled over at a little, free, local museum, called Dawes County Historical Museum. It ended up being absolutely delightful. 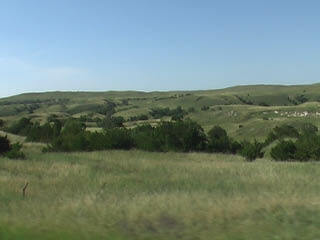 It is on Hwy 385 in Chadron, north of Alliance, and almost to the border of South Dakota. 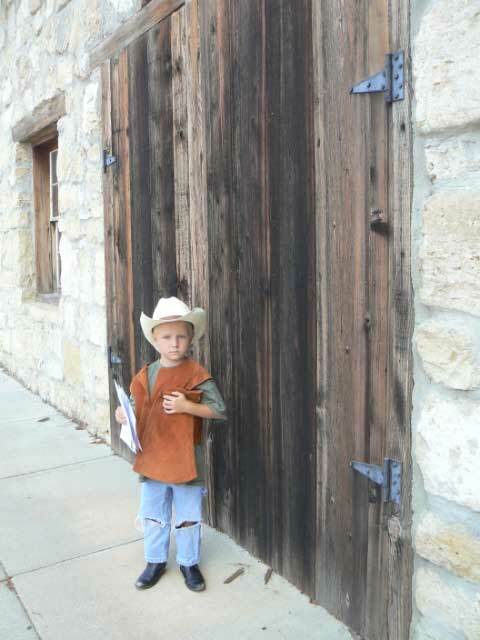 We enjoyed the old log home and farm we could go in. The church was sweet and the school house was really great. There was a ton of old farm equipment in a field nearby. The main building of the museum was huge! They had so many neat things crammed in there! We could go back at least one more time. It was wonderful. It is on the left hand side of the road, heading north. 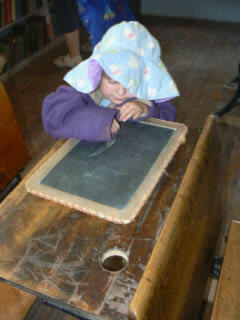 It is the local county museum run by volunteers. 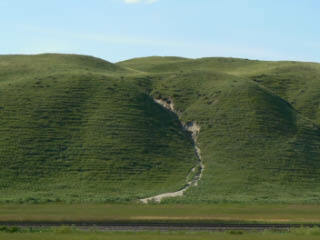 If you ever have the opportunity to drive through the Sandhills - do it. If you need peace for your heart and soul - I haven't found a better place. Just stick your toes in that sandy river and relax. 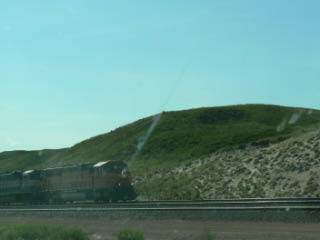 We continued on to our current destination, the Black Hills of South Dakota. What a great time! In the following product guide there is a movie on canoeing in the Sandhills. I bought it myself, off of Amazon. It is a good movie and well worth the 1.99 rental. It is short, but good. Geographical Center of the United States, Lebanon Kansas and that Mean Rooster! It was one of those, "we are complete tourists" moments. 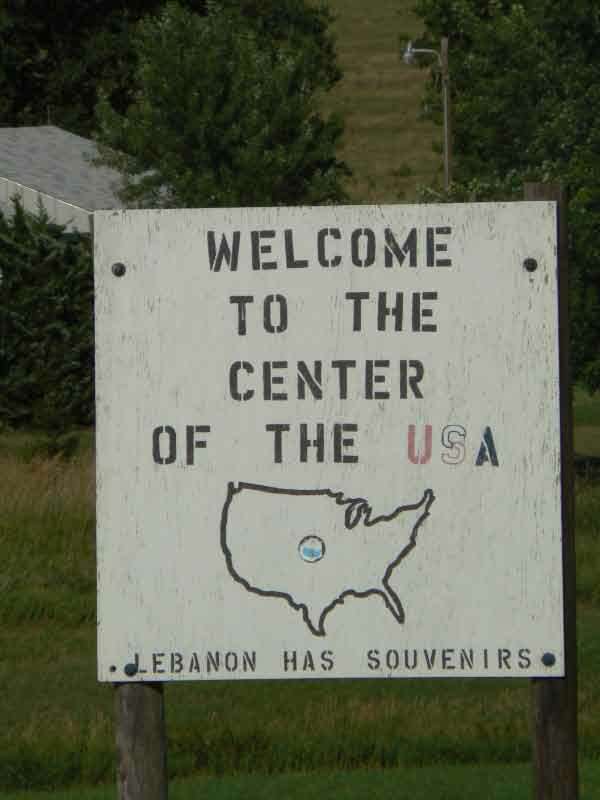 We drove all the way to the geographical center of the continental U.S. 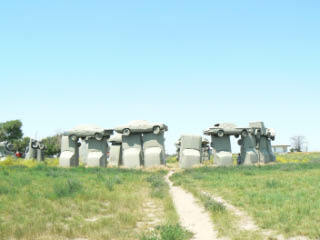 It was in the middle of nowhere in Northwest Kansas. We had to go one mile north and then one mile west of Lebanon, Kansas. The guys at the gas station just before it said we could camp there if we wanted to and that no one would say anything. They said if we got any grief just let them know. Well, we drove out there, and it was a hoot. 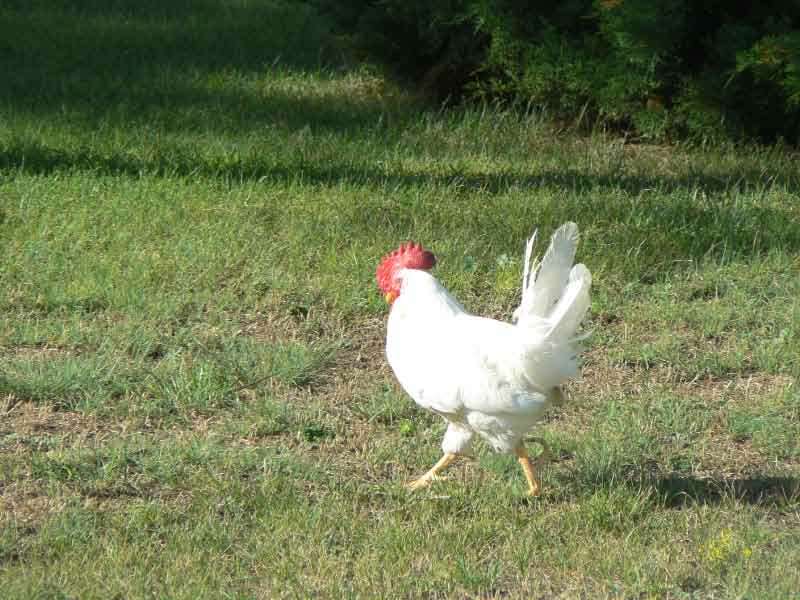 There was nothing around but an old, abandoned motel and a mean rooster that kept trying to spur Shae! Mean ol' thing. It was big and white, with a big crow. It just stood on the nice picnic table and crowed his little cold heart out. He was letting us know it was his territory and we should leave. I would have loved to let the kids run around, it was actually a neat place. 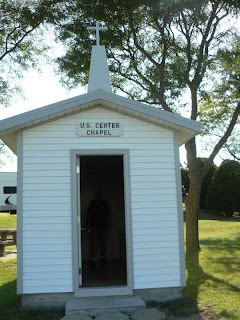 There is a nice picnic area and a large monument that says it is the center of the continental United States. There was a little chapel that we went in and sang songs. Shae preached. He said, "Love God, Love People, that says it all." We all laughed. 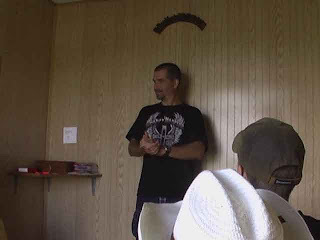 It was great to see that Jesus is still in the center of the U.S.
Gabriel loved looking at the cows in a nearby field. 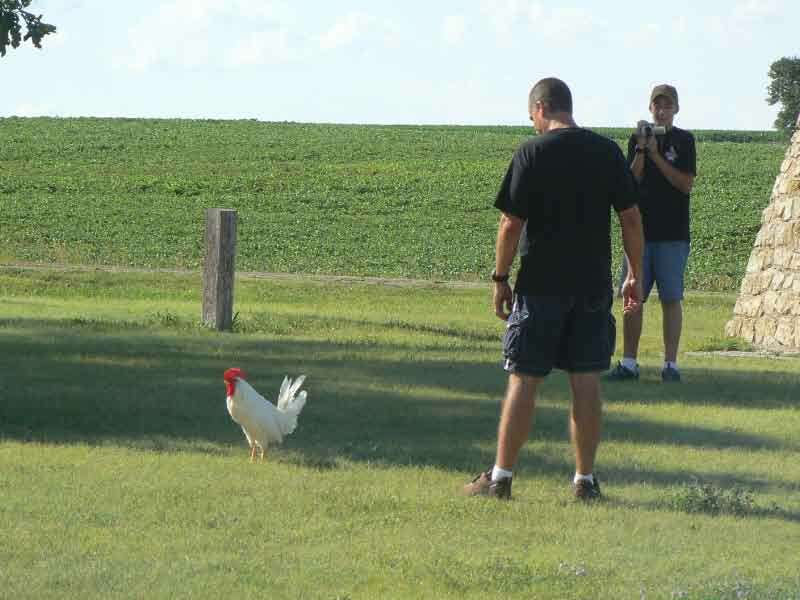 I wanted to shoot the darn rooster and eat dumpling for dinner. He was mean and I wanted to let my kids play. I told Cody to go get his gun, but then someone drove up. Good thing for the rooster, his days were numbered in my book. Two guys drove up on their motorcycles. They were from the area. 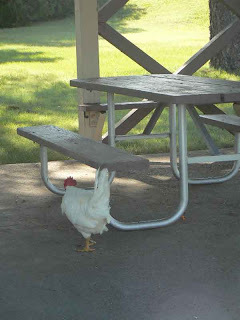 They said the rooster is the town pest. 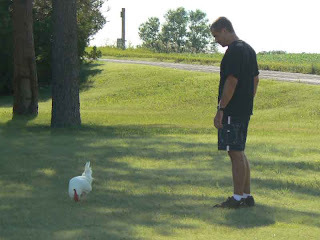 Anyways, it was fun and now we can say we have been there.... Shae told me he would not have let me shoot the bird. Oh well. Yesterday, Tuesday the 14th of July, we stopped by a gas station here in Marysville, Kansas. After two hours on the road I was beat - I know, pretty wimpy. I was pretty tired so I had Cody run in and ask the attendant if there was a campground close by. She said we could camp at the city park. I wasn't too sure about this, but thought we could check it out. During our last visit we took a stagecoach ride through the city park. We can stay for free and it has 50 amps, water, and a sewer dump. We are so thankful. 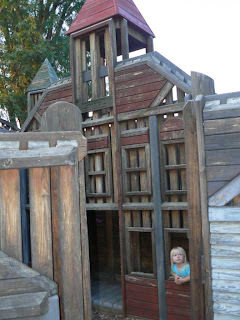 There is also the most awesome playground ever. It is made to be similar to the actual town! Look for the black squirrels around town. We got up late this morning. We hiked to the Chamber of Commerce. They had a lot of great info. 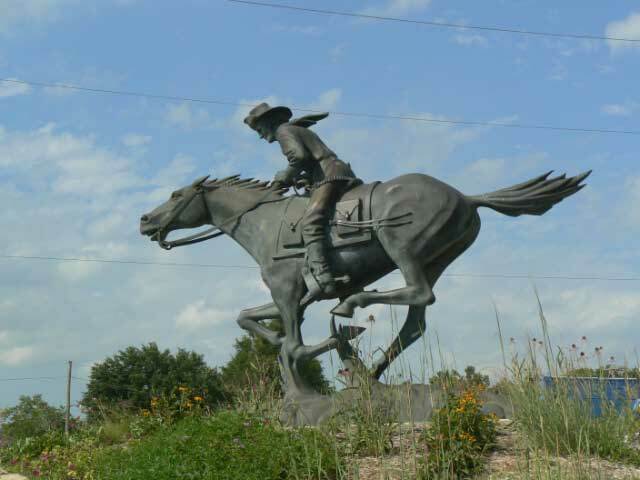 We visited the Pony Express Station One museum, and hiked to the Pony Express Monument and Murals. The murals look like they are moving! It all was a lot of great fun. 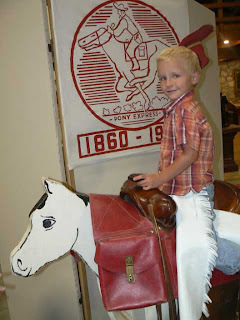 Gabriel has decided he wants to be a Pony Express rider and not a bull rider! Sounds good to me! 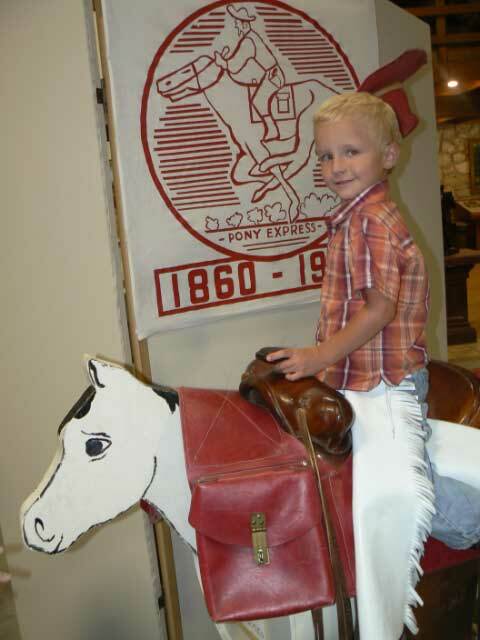 The Pony Express Museum was wonderful. It was $3 per adult and just a little for kids, I can't remember the exact price. There was a movie, a pretend horse that Gabriel didn’t want to get off of. Josephine thought the carriage was her princess carriage. 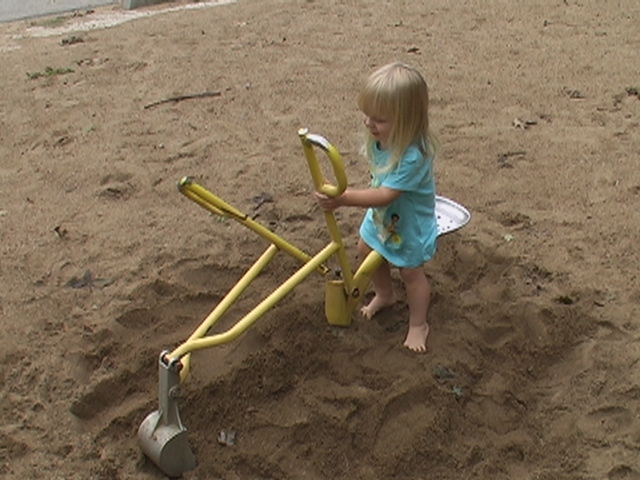 She sat in it for over ½ an hour. The history in this town is amazing. 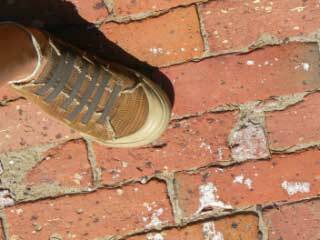 The main streets are still made of brick! It is stunning. 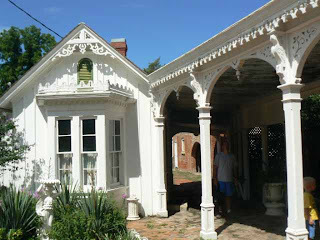 The old buildings and shops are so neat to see. We went to the Koester House. It was from the middle 1800’s. We got to see an old piano worth over $100,000! Had to watch the kids in that room. Since the kids were so well behaved, the tour guide took us behind the ropes and played an old music box worth over $15,000. It was so beautiful sounding, I could have listened to it for hours. 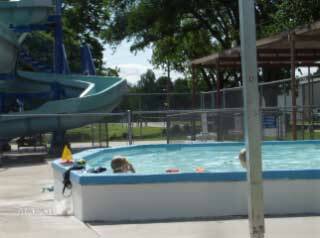 We had a great time at the pool today. It was a wonderful place. 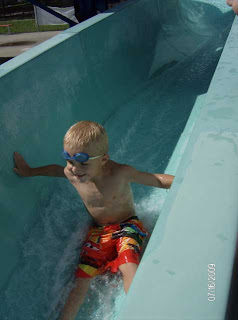 There is a kiddy pool for seven and under. There is also a huge water slide. We bought a season pass as that was less money than buying numerous daily passes for our entire family. Most people have heard of the Donner Party from 1846. They are the group of 87 pioneers heading west that got trapped in mountains in California. Their story is tragic and horrific. 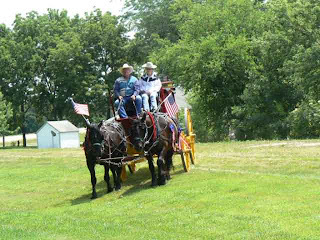 Not many people know this same group passed through Marysville, Kansas. 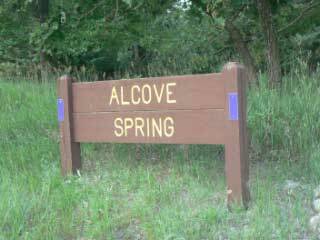 We took the hike to Alcove Spring near the Big Blue River. 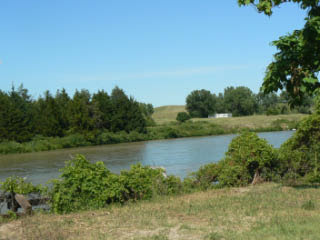 It is the location where many of the wagons took a ferry across to continue their journey west. 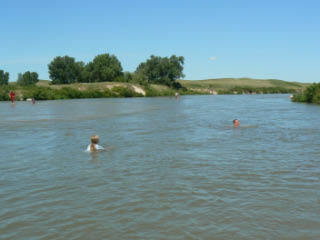 If the water was high the wagons and people would wait until it was safe to cross, which could mean days upon days of camping in the fields surrounding the river. 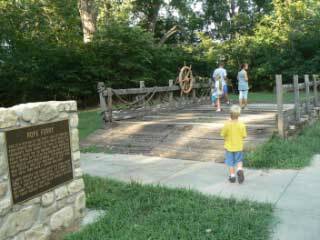 The Donner party was one of hundreds that passed through this area on their trip west. 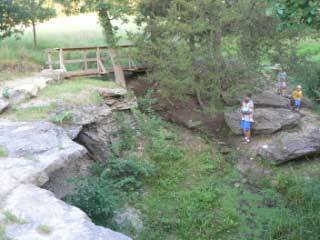 The hike to Alcove Spring was easy and a great historic experience. 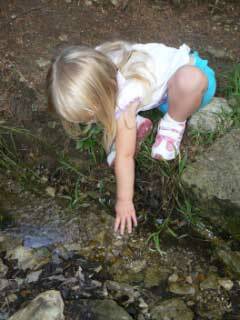 We got to see original carvings made by some of the pioneers and see the spring that many of them frequented. 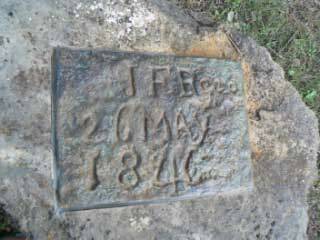 It was so amazing to get to walk where the pioneers walked and see what my husband called, "their graffiti". But, on the way back to the van things weren't as pleasant. We had to cross a bridge. Shae was carrying Josie, I was walking with Gabriel and Naomi and had Tytus in the sling. Cody and Hanna had taken a different trail back to the van. The rest of us went back the way we had come. Shae was in the lead. He had to go potty and found the perfect tree. He set Josie down and began to walk off the trail. He suddenly began yelling at Josie to get back. I started to run towards her. Shae jumped and then kicked his leg towards the ground. I saw grass, weeds, dirt, and a copperhead poisonous snake fly through the air in the opposite direction of Josie. I grabbed Josie by the arm while trying to hold Tytus’ in the sling. 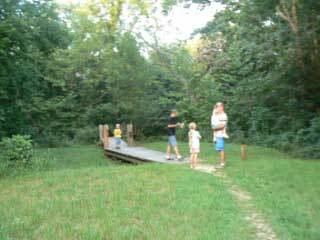 We ran back to the bridge and as far from the grass as possible. Josie was crying loudly. Shae began searching for a large stick to kill the horrible creature with. All he could find was branch with lots of small branches on the end. He stabbed at the snake over and over again. The snake kept striking at the branch and trying to come towards us instead of getting away. Finally, Shae got it to head down a hill away from us. He chased that thing down the hill with that branch. Gabriel stared at his daddy with awe and respect. He talked about the incident a lot that night. We praised God over and over for protecting Josie and Shae. Shae said he has never kicked a poisonous snake with his foot before and especially in sandals! Wallace State Park was very nice. Our campsite had a really long pad so we were able to park the van and trailer behind it also. It had two good playgrounds and last night the kids played in the water faucet at the one playground and got soaked!! 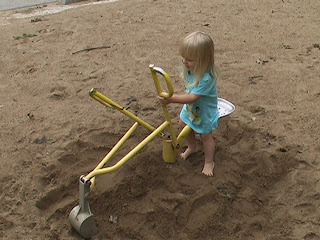 The other playground had one of those backhoe toys you sit on and scoop dirt. This morning Gabriel told me a story about how he was getting red leapers (?) with it. He had quite a huge story about it. The kids and I took a very nice walk around a field picking flowers and looking at different kinds of trees. I talked to Dr. Sohrab, she said I have severe asthma. I told her about all the mistakes she had in her doctor’s report at my last appointment. She said that my history doesn't really matter, the fact is that I have asthma now. My concern is if insurance gets that information they will say my condition is pre existing. I also talked to the guy from the pulmonary lab. He agreed with her diagnosis. They both said to stay on Pulmicort and Proair . They both said I have severe case of it right now. My peak flow reading is 150. At the end of my pregnancy it was only 124 at its best. It should be 400. I’m in the red danger zone, but hopefully starting back to the inhalers will help. We've left MO heading towards drier climates so hopefully that will help also. After 2-4 weeks on the Pulmicort I should notice a difference. The lung specialist said two cups of strong coffee is a good in the field remedy for an asthma attack. Dark Chocolate helps an asthma cough according to the Pulmonologist. I also talked to a nurse and she said she uses caffeine to control her asthma. Another lady told me apples are the best food for asthma. I’m not totally sure I have asthma, I think it was a combination of things that started this. Stress, pregnancy, bronchitis, exposure to fumes, I think it was all more than my body could handle. I do have hope that I’ll not have to live with this, though all the reports I've read say there’s no cure. I know that Jesus is my healer. He can overcome anything. We’re on our way and are in Kansas now. It’s very beautiful. Low rolling hills with lots and lots of farm land. It’s a lot cooler up here, yet still warm. We were able to play outside even in the middle of the day. Down in southern Missouri it was too hot even at 9:00 am. Woke up early hoping to get off early this morning since we didn't get off last night. Thank goodness my mom made us lunch and dinner yesterday and Meg made us biscuits and gravy this morning. Sure saved us a lot of time not having to clean the kitchen. We really appreciate their thoughtfulness.. It was really hard to say bye to mom. She cried as she hugged us. After breakfast it still took us about 2 and a half hours to get ready to go. It takes awhile to get things ready to go after we've stayed somewhere for a long time. The trip is going to be harder this time out. The two biggest changes are that we have a wonderful baby, and I'm not well and am trying to still get my lungs clear. We're heading west, so hopefully the dry air will help me some, but I’ll talk more about that in another entry. I’m driving the van this time, having little Tytus made it where we wouldn’t fit in the truck anymore. We bought our 15 passenger van and now we’re like the typical home school family with a van full of kids! Behind my van I’m pulling a trailer that has 4 ATVs, 3 kayaks, and 7 bikes, and a 4 horse boat motor that we’re hoping to scrounge up the money to buy a boat for. Shae and Cody got the camper all hooked up to the truck and we pulled out somewhere around 1:00pm. We didn’t make it 20 min down the road before Gabriel said he had to pee. We had a little pee jug we got when Shae had his kidney stones removed. So Naomi got that out and Gabriel tried to get his wee wee out of his pants and into the bottle while still in his car seat. Hanna and I were panicked when he didn’t get his wee wee into the bottle, we knew that pee was gonna get all over the van. “I have to pee and poop!” Gabriel announced after unsuccessfully getting the bottle fixed. I got the walkie talkie and told Shae the bad news. He told me to pull over wherever he pulled over so Gabriel could use the toilet in the camper. There was a place to stop on the side of the on ramp leading onto I-44. We stopped there and I took Gabriel into the camper. He then told me he didn’t have to go poop, just pee. I told him he was going to sit there until he pooped since we had to stop. After a minute I realized that there was no poop coming, so I got him off of the toilet and brought him back to the van. I opened up the door to find Tytus bright red screaming. You know how babies wake up whenever the vehicle stops moving. I kneeled next to his seat and did the nursing over the car seat bit. He was very hungry and very happy to nurse. Tytus began to fall asleep so I quickly got back into the drivers seat and told Shae to get back on the road quick. Hopefully we’ll make it more than an hour from where we were. All the kids are sick except for Tytus and Naomi. Hopefully they’ll get well soon. We’re suppose to be in Nebraska tonight, but that’s not gonna happen. I’m not sure where we’ll end up. It was about 6:00 in the morning and we were asleep in bed when a typical Missouri storm came out of nowhere. We woke to the sound of large hail hitting the roof and the wind whipping around our awning. Shae jumped out of bed, slipped on some clothes, and ran to put the awning in . In that short amount of time he was too late. 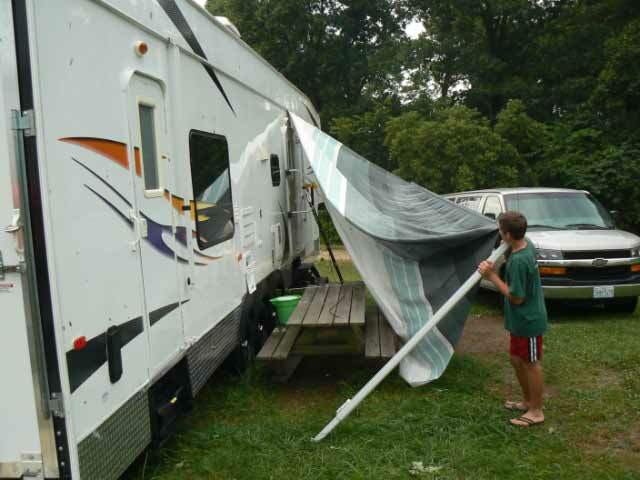 The wind had bent the frame of the awning and ripped the material part of the awning from the camper. There was no hope of fixing it, so much hardware was bent and broken. Cody got up and went out to see what had happened and if he could help Shae. The guys were checking this out and lighting was striking all around us. I asked them to come inside and wait until morning to fix it, but you know them, they’re gonna do what they’re gonna do, so they stayed out in the lightning storm. Later on that morning, Shae looked over the awning and decided that we needed to take it off because it would not ride well down the road like it was. He got up on the roof to reach the higher parts of the hardware and Cody stood below holding on to one of the poles. When Shae disconnected one side of the awning it fell and hit the side of our van. Thank goodness it hit the passenger side mirror. The mirror pushed into the side of the door and the awning slide down the door and left a nice dent and scraped the paint all the way down to the metal. In all it’s about 2,000 dollars worth of damage. Shae came in and told me about the awning falling down on the van and we both just busted out laughing. What else could we do but laugh? Shae had enough forethought to take pictures of the mangled awning against the van before putting it up so maybe the insurance will cover it. I told Shae maybe we should stay home the rest of the day and not do anything so nothing else would break. But, we decided to try to leave..